Shares of Blue Apron Holdings, Inc. (NYSE:APRN) were sliding last month as the company forged direct sales partnerships that garnered mixed reactions from the market, and investor nervousness continued about the meal-kit service amid rising competition. The broader sell-off in the market also seemed to weigh on Blue Apron. As a result, the stock finished October down 17% according to data from S&P Global Market Intelligence. As you can see from the chart below, the stock fell throughout the the first three weeks of the month but rebounded toward the end of the month on news of a deal with Jet.com. Blue Apron started off the month on a sour note after the company said it would begin selling its meals through Grubhub (NYSE:GRUB) in New York City, enabling delivery of its meal kits in 30 minutes or less. However, the market did not seem to appreciate the move, and it confused some analysts as Grubhub's platform is geared to restaurant takeout and delivery. Therefore, it seems unlikely that Grubhub customers would order a Blue Apron meal kit, since they would have to wait for it to be delivered and then take the time to cook it. The immediate gratification that is essentially Grubhub's raison d'etre is neutralized. Blue Apron continued to swoon in the following weeks, hitting an all-time low at $1.02 as the stock was pressured by the market rout. However, toward the end of the month Blue Apron got a much-needed boost from a new partnership with Jet.com, which became the first online retailer to sell Blue Apron meal kits, offering same-day delivery, but again only in the New York area. Though the deal is unlikely to move the needle for Blue Apron since it only serves one region of the country, it opens the door to potentially selling in Walmart stores, as Jet.com is a subsidiary of the retail giant. With its third-quarter earnings report coming out next week, Blue Apron desperately needs to show progress in returning to growth. 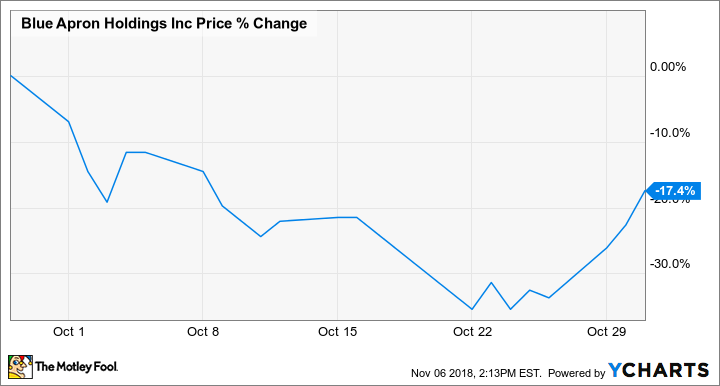 A pullback in marketing following operational errors last year has caused revenue to fall sharply this year, and analysts are expecting revenue to decline 25.4% to $157.2 million in the third quarter, but also see its loss per share narrowing from -$0.47 to -$0.22. Beating those numbers would be a sign to investors that the company is on the right track, and new CEO Brad Dickerson's strategies are taking hold. If the company misses the mark again, the stock could fall below $1.